Offering a full-on front view of the Sagrada Familia's nativity façade, Gaudi's Nest Apartments is located in Barcelona. 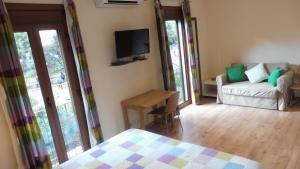 The property offers air-conditioned and heated apartments with free WiFi and access to a large panoramic shared terrace. Featuring wooden floors, each 2-bedroom apartment has a living room with 2 sofas and a wide flat-screen TV. A washing machine, oven and microwave are included in the kitchen. The bathroom comes with a hairdryer and a shower or bathtub. The shared terrace is furnished with tables, chairs, deck chairs and parasols. Gaudi's Nest Apartments offers daily front desk assistance from 09:00 to 20:00. A wide variety of supermarkets and shops can be found in the area. The apartments' bar restaurant, El Tastet de l´Artur, offers breakfast and Spanish cuisine. Sagrada Familia Metro Station, 100 metres from the apartments, offers fast connection to the historic centre, beaches and FC Barcelona’s Camp Nou Stadium. Offering front views of the Sagrada Familia, this air-conditioned apartment has a living room with french windows, a sofa and satellite flat-screen TV. The two bedrooms feature a balcony and the bathroom comes with a hairdryer and a shower or bathtub. There is a kitchen with a washing machine, oven and microwave. Rate: € 138.00 ... € 174.00; select dates below to get current rates. Featuring 2 balconies, this air-conditioned 65 m² apartment comes with 2 spacious double bedrooms with king-size bed, living area with sofa bed and a flat-screen TV in each room. There suite has 1 bathroom with a spa bath, shower and hairdryer. 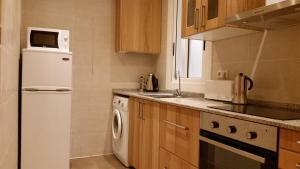 A washing machine, oven and microwave are included in the fully equipped shared kitchen. Rate: € 138.00 ... € 150.00; select dates below to get current rates. Rate: € 102.00 ... € 174.00; select dates below to get current rates.